This summer, Im exploring a variety of Web sites and tools that you can use in the classroom and/or for your own professional development. Each week, Ill talk about how it works, point out related sites, and discuss classroom connections. 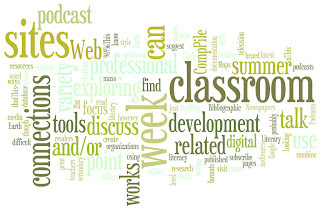 This week, I focus on a text cloud program called Wordle. You have probably seen a tag cloud. Its a collection of the tags for a blog that uses larger and bolder fonts for the tags that are used most frequently and smaller regular fonts for the tags that are used less frequently. Tags between the two extremes are sized based upon where they fall on the spectrum. You can see the Tag Cloud for this blog over in the right sidebar, below the names of the Editors. 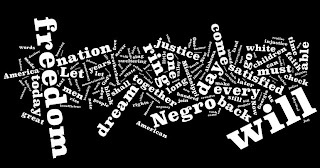 Wordle applies the structure of tag clouds to any chunk of text you'd like to analyze. The site includes a gallery of examples, which you can browse through to choose some appropriate to choose with students and colleagues. Perhaps you could use The Declaration of Independence as part of your discussion of colonial America, for example. Theres also a search that will help you find examples you might share. Remember that the tool is open to the general public, so there may be inappropriate texts in the Gallery. Using the pull-down menus included with the map on the Wordle page, I played with the font, the colors, and the layout of the map until I arrived at one I liked. Wordle uses Java to work its magic, so you may need to update your version of Java for the tool to work. The FAQs on the site include suggestions and a link to the downloads. The top 150 words were exactly those that I would have wanted. The four largest words in the cloud (students, assignments, curriculum, and writing) are exactly on target for the focus of the chapter and the book as a whole. Students can try a similar analysis and look at the words they use more frequently to see how they represent their writing. The tool is robust enough to handle most texts that kindergarten through college students are likely to create. The manuscript version of my first chapter is twelve pages long and contains 2850 words. That length is far more than the average for most student papers. After reading “The Raven,” students could examine how the cloud represents the story that the poem tells. 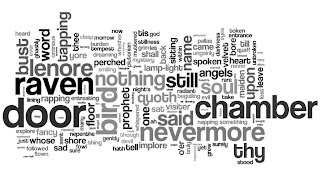 Most will recall the repetition of key words such as raven and nevermore, but will they notice that the word soul is used more frequently than tapping and rapping? As I looked at the cloud for “The Raven,” I couldnt help feeling that I had created a piece 21st century text in its own right. Im not sure where I want to use that image, but I really like it and may use it elsewhere. Fortunately, Wordles creator, Jonathan Feinberg, gives all rights to the images to the creators and even allows them to make money with them. See the FAQ for more details. If I wasnt sure that I had a new text when I created the cloud for “The Raven,” I was absolutely sold when I saw this one. I might use the image as an introduction to the speech, but it could just as easily be used as an intro or culminating text for a unit on the Sixties and Civil Rights. This may be my favorite image so far. I adore the size difference between the word freedom and the word jail (look for it under and to the right of the word will). I could spend exploring the ways these words flow and relate. If I could, Id blow it up to poster size and add it to the wall in my office. Wordle is a fairly basic site, but the results are anything but basic. Go play. Youll catch the bug too. Youve probably heard or read the word podcast. Radio and television shows urge their audiences to subscribe to their podcasts for the latest updates. Newspapers suggest readers visit their podcast pages to find digital connections to the stories they print. Podcasts do not have to be published by mass media organizations however. Its just as likely though that youll find a podcast by a colleague, your public library, or students youve taught. To provide some background, let me explain what a podcast is. A podcast is a series of audio broadcasts that is distributed using an RSS feed. You can think of it as the 21st century version of a radio show. In fact, many radio stations and radio production companies post their radio shows online as podcasts. Chicago Public Radio, for instance, posts episodes of This American Life as podcasts, and my local public radio station, WILL-AM, posts podcasts of all the daily agricultural reports. I should note that people do misuse the term podcast. In technical terms, an individual audio file that is not distributed by an RSS feeds is not podcasts. Its just a basic audio recording. Such stand-alone audio files can be useful and fun, but for this week, Im focusing on legitimate podcasts only. True podcasts provide new, ongoing resources while single audio files are one-time publications. You subscribe to the RSS feed of a podcast and then download and listen to each episode using an audio player like iTunes or Windows Media Player. You can find complete instructions for the process using iTunes from the Apple website. Now that you know what a podcast is, how do you find ones that you are interested in? If you use iTunes to listen to podcasts, you can visit the Apple Store, click on the Podcasts link, and begin finding the latest podcasts that have been published. There are similar ways to find podcasts in other audio players, but I use iTunes. There are also sites that list educational podcasts, such as the Education Podcast Network (http://epnweb.org/). You can also seek out podcasts at the sites of professional organizations that you already know as well. Organizations like the American Library Association, the International Reading Association, and International Society for Technology in Education (ISTE) all have podcasts that might interest you. Id be remiss if I didnt share details on two monthly podcasts published by ReadWriteThink each month: Chatting About Books: Recommendations for Young Readers and Text Messages: Recommendations for Teen Readers. In Chatting About Books, host Emily Manning chats with kids, parents, and teachers about the best in childrens literature for ages 4 through 11. Discussions include reading tips and fun activities to do with children before, during, and after reading. Text Messages podcasts provide book recommendations that adults can pass along to preteen and teen readers. Each episode features one in-depth recommendation plus suggestions of several other related books, audiobooks, or films that will engage and excite teen readers. This summer, Im exploring a variety of Web sites and tools that you can use in the classroom and/or for your own professional development. Each week, Ill talk about how it works, point out related sites, and discuss classroom connections. This week, I focus on online resources for building documentation citations. Bibliographic style can be difficult to teach. There are exact formats that have to be followed precisely. Differences among citations may seem eccentric to students, and even more eccentric can be the differences among citation formats (e.g., MLA versus APA). Most language arts textbooks include the most basic details on these citations. Websites like the Purdue OWL provide extensive lists and explanations on citations and reseearch writing. With these resources to guide students, writing bibliographical citations is just a matter of plugging details into an equation: Last name, First name. Book Title. Place of Publication: Publisher, Date of Publication. Its simply an eccentric process of fill-in-the-blank. Thats why online documentation tools can supplement the process in useful ways. Using online bibliographic entry generators, students still complete the process of filling in the blanks, but they can be less overwhelmed by the task. The process is really the same as it would be for someone using a language arts textbook: determine the kind of text and fill in the blanks of the citation form. Naysayers will argue that these generators take away the responsibility to learn how to write bibliographies. I dont think thats the case. Students still have to determine the kind of text properly. If students cant tell the difference between a single-authored book and a book authored by several people, they arent going to find the right format—whether theyre working with textbook instructions or an online generator. Further, students still have to find all the necessary details for the texts they create citations for. No online generator is going to fill in the details students leave out. If the student skips place of publication, its going to be missing from the citation. Thats where editing and proofreading come in. No matter how students create their bibliographical entries, theyre still responsible for checking the entries against the standard formats and correcting any errors. Online citation builders are just the 21st century way of filling in the blanks. For this weeks web highlights, I'm sticking to free sites. There are web-based services that ask for a fee of some kind, and there are pieces of stand-alone software, like EndNote (a sophisticated program that is probably beyond the needs of most KCollege students). These tools are great too, but Im focusing on tools that can be used in any classroom with the right computer and Internet resources. This barebones tool builds only seven kinds of entries. Its simplicity would be perfect for elementary and middle school students whose sources are fairly traditional. From the University of North Carolina University Libraries, this online tool can create only six kinds of entries; however, the related forms allow for more complex kinds of texts (e.g., multi-author books, online and print journal articles). Dont let the limited number of choices on the homepage fool you. This tool can produce rather sophisticated entries and requires students to know which information is relevant on the forms for the texts they enter. Its best suited for secondary and college students. This versatile site offers three different citation makers: MLA citations for elementary students, MLA citations for middle and secondary students, and APA citations. Like the UNC University Libraries tool above, the MLA citations for older students includes forms that can result in rather complex citations. The Citation Maker for Elementary Students narrows down the options a bit. The pages in this tool are rather text heavy, making it appear a bit busy. Students would benefit from teacher demonstration and modeling to help them learn how to use the large amount of data on the pages. EasyBib is a complete tool that includes forms for three dozen different kinds of texts, including advertisements, email messages, interviews, and photographs. Despite this wide range of options, the forms are fairly simple and, with guidance, could be used even with middle school students. If students are to use the tool independently, its more appropriate for secondary and college students. The citations that the tool creates can be printed, saved as an RTF file, or viewed online (and then copied and pasted into another document). Note that this tool does include pervasive links and encouragement to purchase the companys MyBibPro, but the free tools convinced me to include it. The tool is very complete, allows for annotation, and includes links to Facebook and MySpace communities that are bound to capture students attention. Citation Machine is less slick than EasyBib, but it includes basic citation forms for not only MLA and APA, but also Chicago and Turabian—plus there are no annoying “Subscribe” links. The default links on the site include the forms for typical kinds of texts. Be sure to click the “More?” link under MLA and APA to expand the list to access a wide range of citation types, including podcasts, television shows, and government publications. With support from a teacher or librarian, the tool could be used by middle school students, but is probably best for secondary and college students. This summer, Im exploring a variety of Web sites and tools that you can use in the classroom and/or for your own professional development. Each week, Ill talk about how it works, point out related sites, and discuss classroom connections. This week, I explain why writing teachers at the secondary or college level should know about CompPile. 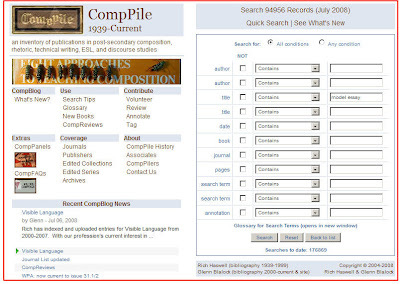 And because the materials in CompPile have been catalogued by composition and rhetoric teachers, they include keywords and other information that you probably wont find if you simply use Google to search for resources. The site catalogues articles from 306 journals, review essays, books, dissertations, and articles in edited collections or anthologies. Lets say that you wanted to know more about using portfolios, but you need to do a bit more research before you settle on your final plans. Go to CompPile and do a Quick Search for the word portfolios. In no time, the database will return the first of 627 entries that discuss using portfolios in writing instruction. You'd probably want to narrow the search down. Go back to the CompPile homepage and you can narrow things down by date, specific journal, authors, and words in the entrys annotation. Once you focus and find the best resources, you an export a list of resources or print entries as you find them. You will streamline your research time by finding the best resources quickly, and youll have a ready list for your trip to the library! If you teach writing, you should spend some time playing with CompPile. Youll find new resources to read and a great new tool. When you visit, be sure to check out CompFAQs, the sites collection of answers to frequently asked questions about composition and writing instruction. The site is a live and growing thing, always adding more information and resources for writing teachers. To see the latest additions to the collection, simply visit the site blog, and youll find details on recently catalogued items, information on site upkeep, and other interesting information. If youd like to contribute the site, check out the details on how you can help on the Volunteers page. This summer, Im exploring a variety of Web sites and tools that you can use in the classroom and/or for your own professional development. Each week, Ill talk about how it works, point out related sites, and discuss classroom connections. This week, I focus on using Google Earth to create 21st Century Literary Maps. Looking for ways to combine digital literacy skills, research, literary study, reading and writing for the web, and more? All you need is Google Lit Trips! This one tool can provide cross-curricular connections, literary exploration, and 21st century literacy skills. Its simple. Literary Maps + Google Earth = a great classroom resource! Literary maps were a highlight of NCTEs Annual Convention last November. In case youre unfamiliar, a literary map shows locations related to a piece of literature, the life of an author, or literary locations in a particular place (e.g., all the authors born in a state). When NCTE first began inviting affiliates to bring literary maps to convention, the maps were typically made of poster or display board, like those shown in the 1994 English Journal article “The Making of a Literary Map.” The maps included in Google Lit Trips show what happens when literary maps are plotted out online, on the backdrop of the satellite maps that comprise Google Maps. This image shows the locations on a Google Lit Trip for Elie Weisels Night, created by Technology Integration Coordinator Jerome Burg. Burg, who teaches at Granada High School in Livermore, CA, has plotted significant locations on the map of Europe, indicated by the Stars of David. When loaded in Google Earth, the map includes pop-up windows that include additional information, links, and photos. To see how the maps work, watch my overview of several maps. Whats it take to use these maps in the classroom? A free copy of Google Earth and a download of the map from the Google Lit Trips on the site. The Lit Trips site includes instructions and tips making the process very easy. You can use the maps that are already on the site or design maps yourself or with students. Go ahead. Youll find it strangely addictive. Convention Connection! Google Lit Trips creator Jerome Burg will present “GoogleLitTrips: Make a World of Difference in Your Classroom&#8221; at NCTEs Annual Convention in San Antonio in November.